FINAL SALE. This A-line dress is made of a unique patterned lace that reminds us of flower petals. The Whimsy and Wonder Petal Lace Belted A-Line Dress is fully lined. 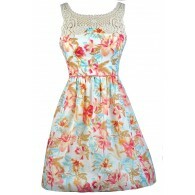 It has a rounded neckline, wide shoulder straps, and an A-line cut. An included belt wraps around the waist, creating contrast. A hidden back zipper completes this look. 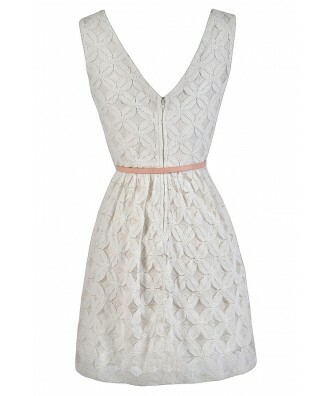 The Whimsy and Wonder Petal Lace Belted A-Line Dress would look nice paired with pumps or wedges for a cute summer look. The pink belt can be removed and replaced with a different color belt or fabric sash of your choosing--mix and match to create all new looks! Details: Fully lined. Belt included. Hidden back zipper. 80% cotton, 20% nylon. Lining: 100% polyester. Remove belt. Hand wash cold gently. Use mild detergent. Non-chlorine bleach if needed. Line dry. Cool iron if needed. Size 3 measurements: Length from top of shoulder to hemline: 34". Bust: 33". 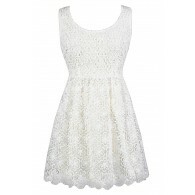 You have added Whimsy and Wonder Petal Lace Belted A-Line Dress in Ivory into Wishlist. 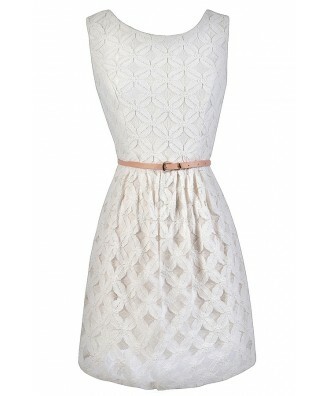 You have added Whimsy and Wonder Petal Lace Belted A-Line Dress in Ivory for Stock Notification. 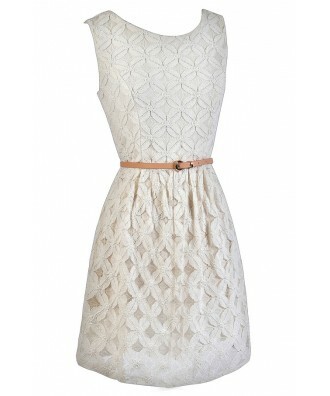 You have set Whimsy and Wonder Petal Lace Belted A-Line Dress in Ivory as a loved product. 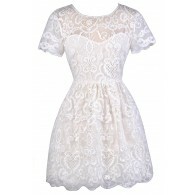 You have removed Whimsy and Wonder Petal Lace Belted A-Line Dress in Ivory as a loved product.